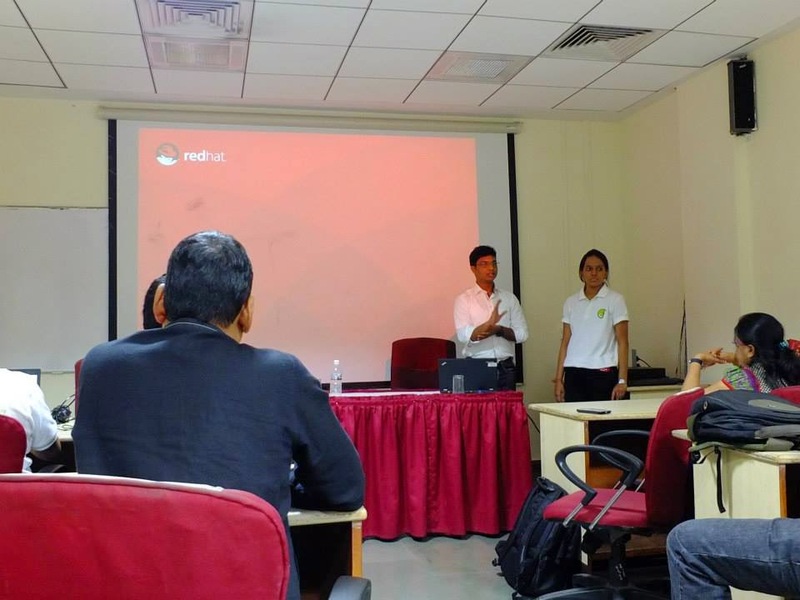 It was good experience to organize Fedora 21 release party At TIFR. Started this idea November last week by initial discussion with Rahul Bhalerao. 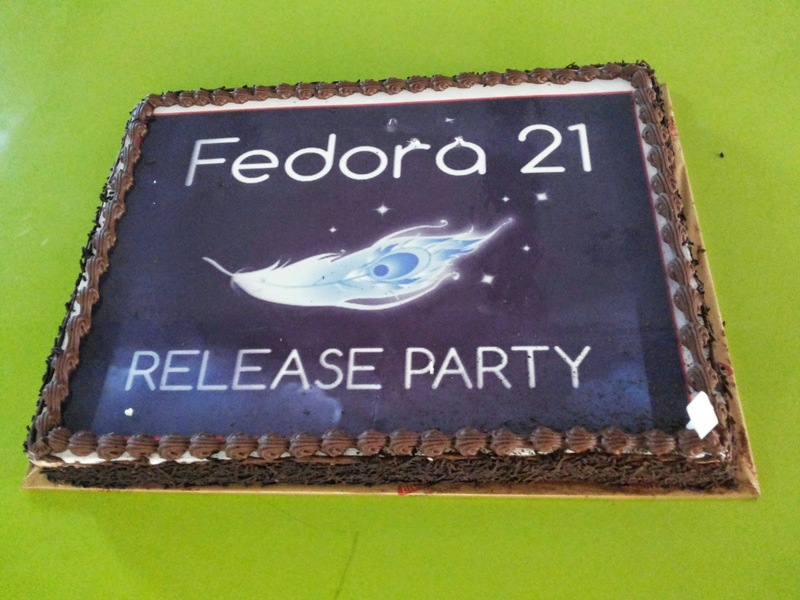 Long time we did not had any Fedora release party in India. Fedora 21 Final release declared on 9th Dec 2014. Rahul agreed to be co-organizer for same. Second we started thinking for Venue. First place name came to our mind was TIFR, HBCSE. This is the place where we started our open source contribution in 2004 under the guidance of Dr. Nagarjuna G.
We started initial email conversion with Dr. Nagarjuna G. we got go ahead response for same but finalizing date was tricky due to ICFOSS, Swatantra (http://icfoss.org/fs2014/) was happening during our planned date (20 Dec). We decided date 21st Dec (Idea was Celebrating Fedora 21 on 21st ☺). Got $100 budget from Fedora and also some travel budget for Pune-Mumbai from Red Hat. Second things was looking for qualified speakers. Fedora community is really nice. I discussed this with Ambassadors in Pune and Praveen kumar quickly jumped in for help with talk on cloud. Due to some reason Parag was not available during same time. Anish volunteered for Talk on Workstation. Me and Rahul took care for Fedora intro and How to contribute in Fedora. I wrote one blog earlier for speakers introduction. We had meeting on 15th Dec At TIFR for planning remaining activities. Created event page on Eventbrite . This was my first event as an organizer and i was wondering on Sunday relaxing afternoon how many people can actually make it. Surprising 38 ticket got booked on eventbrite, it was really motivating. We got Fedora 21 DVD's just in time. Hats off to Siddhesh for helping for it and Rahul for collecting it from Siddhesh. We somehow managed it and made it available on 21st. Got few Fedora stickers from Rupali At Red Hat Pune. I placed order At http://monginis.net/. Online interface has less option. But once one place the order online, we can talk with there customer care with reference number. They delivered order on time. 3+ years with Fedora. Actively working in gnome upstream. He is one of the main developer of ibus typing booster. He is maintaining 15 packages in Fedora. He is going to talk on Fedora workstation product features. 7+ years in Fedora. Own 43 packages and proven packager in Fedora. Team member of Internationalization, Marketing and Ambassador group. TIFR centre is well known for number of open source initiative. Gnowledge.org is one of those major activity. Learning Studio is widely used Fedora 17 remix for educational activities. We are trying to upgrade this on Fedora 21 release. In 2004 when there was very few open source Indian languages fonts were there. TIFR took initiative and started project on developing open source Samyak fonts. These fonts are available in most of the open source distribution. Fedora activity happening in Mumbai after long time. Lets come meet and plan for some future activities around Fedora in Mumbai. Next improved release of Lohit Devanagari 2.95.0 with Latin and ttfautohinted. I would like to thanks Dave for this, who helped to get Latin for Devanagari done from Eduardo Rodriguez Tunni. Now one will not feel major difference while rendering of Lohit Devanagari text with Latin since Lohit has Latin coverage itself. 2. One of the requirement of ttfautohint is to have Latin support in fonts. (AFAIK) Due to this we were not using ttfautohint for building Lohit Devanagari. Now since we have Latin in Lohit Devanagari, we have started building ttf with ttfautohint. It means Lohit Devanagari now requires ttfautohint as a build requirement. 2. We started compiling feature file with Adobe font development kit. (AFDKO). As announced earlier as well. This also helped us to further identified issues in feature file and we fixed those issues in feature file. These were local related issues not tested well earlier. I want to verify Lohit Devanagari with Hindi script gramme  and make sure it follows all rules. Soon i am going to ping some linguist who can help into this. Last weekend i was fully involved in fuel conference. Lots of things i can share about the conference. Let me first start with my role in it. 1. Representing Fedora @ conference. 2. My talk about "Why Globalization? world wide picture"
3. Celebrating 10 yrs of Lohit project and workshop on Lohit2. 1. Represented Fedora @ conference. We started planning for this event with Fedora Ambassador group well 2 months in advance and designed T-shirts for branding Fedora as a best platform for Language computing. This T-shirt was distributed to all active contributors to promote message Fedora perfect from language computing perspective. Most of them were available in conference wearing this T-shirt, it truly made people aware regarding yes Fedora takes care for language computing aspects and proud for same. I met number of people in conference and talked on how can Fedora help them. Specifically mentioned language team is very active in Fedora, most of the innovations happened first in Fedora including IBus, Harfbuzz and Updates regarding Fonts also gets in quickly in Fedora. Fedora i18n team weekly meets AT #fedora-meeting on Tuesday 06:00:00 to 07:00:00 UTC and discuss open issues. Analysed issues mentioned by ShivaKumar K.M regarding corpus processing and requested Biraj Karmakar to test Fedora 21 for Bengali and provide some report. 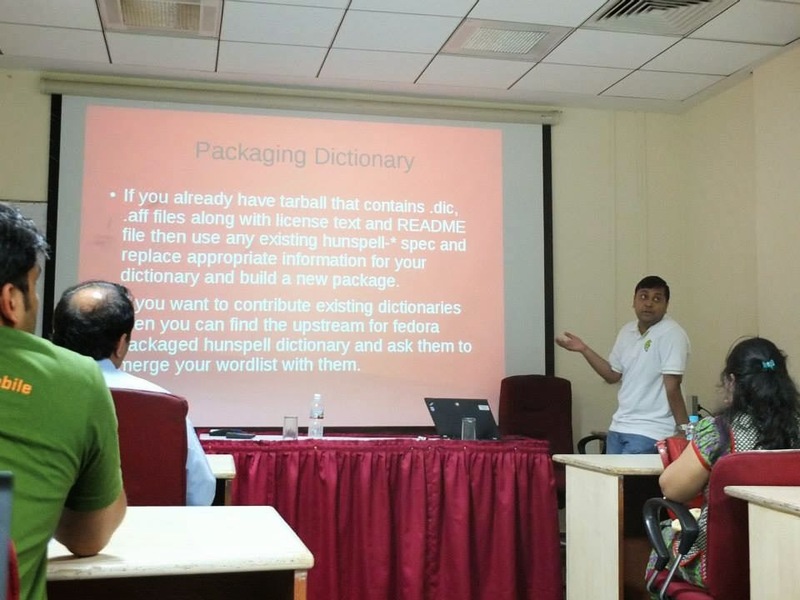 Parag given talk on "How to create hunspell dictionary on Fedora". It was very well attended talk from audience. They learned practically on how to make hunspell dictionary from simple word-list and see it working. It increased there interest on hunspell dictionary. I talked with Omshivaprakash and he suggested it is possible to get some online tool for maintaining hunspell. This is the same thought we were thinking from last couple of months also discussed same with Libreoffice Caolan. Already some work has been done and soon will publish same. Parag also demonstrated wordxtr package avaialable in Fedora. He demonstrated it with html page and shown how quickly one can extract words with it. Wanted to distribute some Fedora stickers but somehow missed to collect some from Siddhesh before he moves to Phnom Penh, Cambodia for FAD. Overall i am happy with the presence of the Fedora in this conference. Will improve it further in upcoming conference around Language Technology. I would like to thanks here Rajesh, Chandrakant and Ankit for supporting activities around Fedora in this conference. This was the first talk on second day. We got pleasing but unexpected rain that day. It delayed most of things. Since i was the first speaker most of the arrangements for speakers happened that time. Started talk around 10:15am. Its tricky subject to present. In this talk i targeted the users. Mentioned the importance of supporting not only major language of world but also as much as possible on platform. How it is important to preserve first languages of people. I have mentioned couple of important research that has been done to showcase how persons first language is very important. Also how first language can help for effective branding of products. Slides are available At slideshare Soon we will have youtube video for my talk. 3. Celebrating Lohit 10 yrs of Lohit project and workshop on Lohit2. This is moment i was waiting for long time. Though number of plans were there. We decided we will celebrate with cake in conference like FULEGILT where number of open source contributors and users get together. Cake arrived on time and we just thought lets start workshop by cutting it. 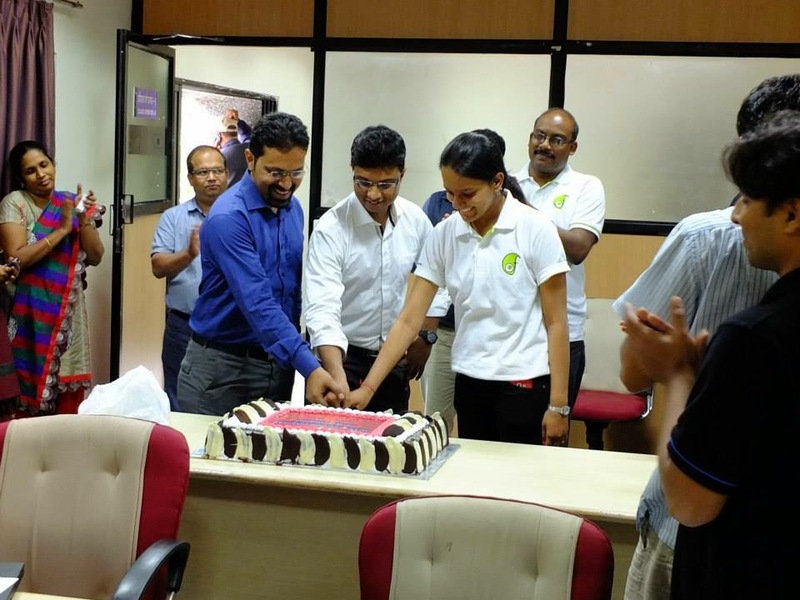 Audience suggested Shilpa (present actively working on lohit2), Rahul Bhalerao (past maintainer of Lohit) and me to cut cake together. Later we had small presentation on Lohit 10 years. In this presentation Shilpa explained why Lohit project is important, What are the achievement of Lohit project in 10 years and what is plan for future through lohit2 project. I am sure in open source it is rare to find people who are not aware of Lohit fonts  or not used it over the years. It is default fonts for number of Indian language in Most of the open source distribution including Fedora, Debian. It was used in early version of Android for Indian languages. It is used in Wikipedia as a Web fonts. Recently Unicode started using it for building Tamil code charts. When talking these are the just few achievement of Lohit project during the time and list is much longer. Numbers of developers from different communities has contributed to Lohit to make it successful project. 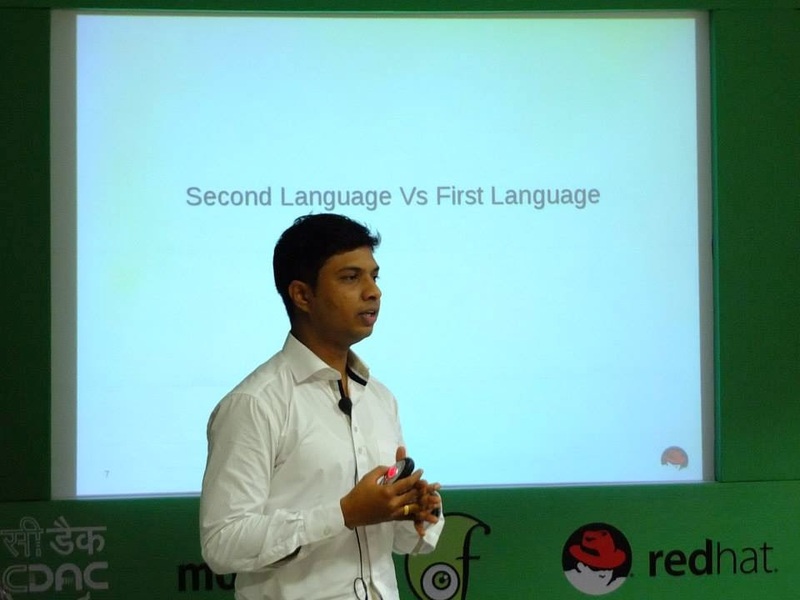 Of course one cant forget the contribution from Red Hat by continuously supporting it and making sure the open source project will get industry standard open source Indic font. 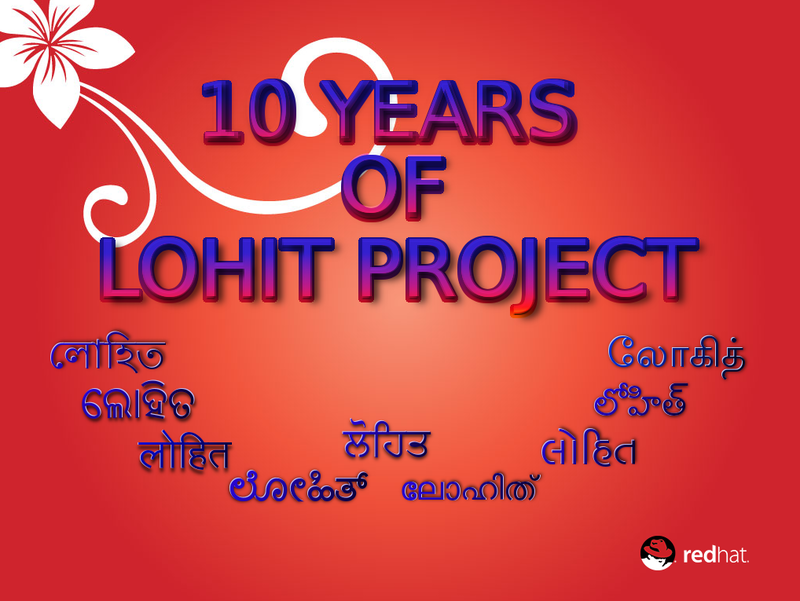 Lohit project completing its 10 years this Nov 2014. 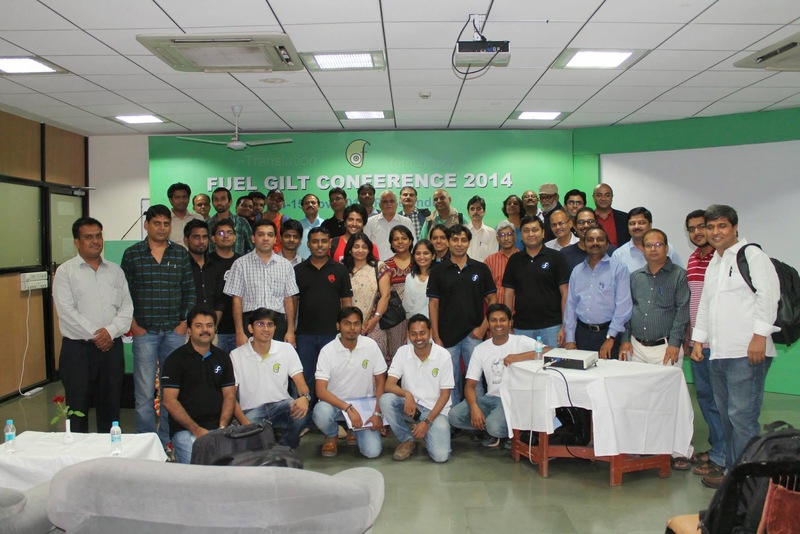 Luckily the fuelgilt conference 2014 is happening during the same time. 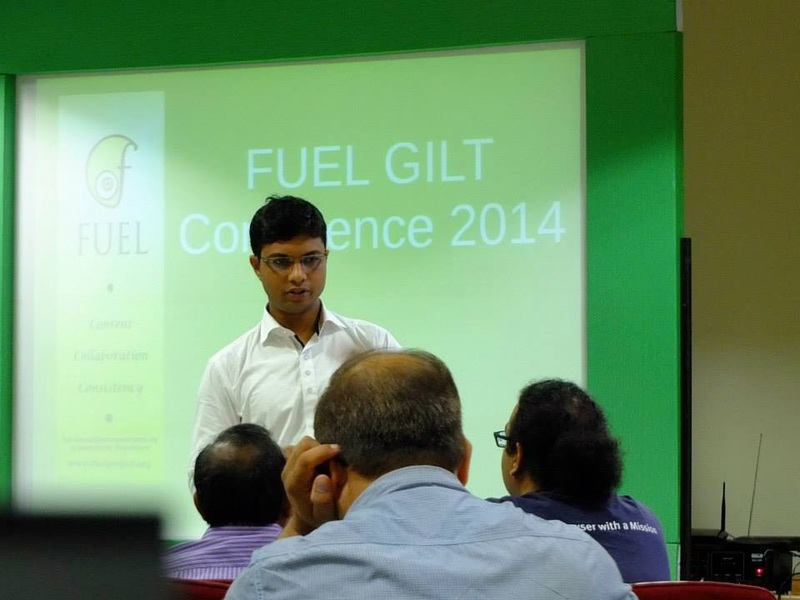 We thought its good time to celebrate the 10 years of Lohit in FUEL GILT Conference - the largest event of FOSS language technology. Our workshop in Lohit fonts is accepted by conference and it is going to happen tomorrow AT 12:30pm fuelgilt conference, Pune India . If you are around do come to celebrate this success. We are going to talk how Lohit project started, how it remain active during the tough times of non-standardize open type layout shapers. What is stands presently and how Lohit2 project going to make Lohit project as one of the standard reference platform for upcoming fonts developments for Indian language. But certainly above issue open up number of issues with this process. Font designers were not able to import .fea file due to this issue. This blog is specifically to update how i am using AFDKO in Lohit project. 1. Write open type tables for Lohit fonts in Fontforge. 3. Generate .ttf by importing .fea file to it using following commands. Makeotf is python wrapper over makeotfexe. makeotfexe can not process .ttf generated from fontforge. In first step makeotf convert .ttf provided to unix Type1 font. It fails with error but it generates unix Type1 font required for makeotfexe. "makeotfexe "-f" "Lohit-Tamil.ttf.tmp" "-o" "Lohit-Tamil.ttf.temp_cff" -ff "Lohit-Tamil.fea" -ga -gf "Lohit-Tamil.ttf.temp.GOADB" -mf "FontMenuNameDB" -shw"
In above argument "-ga -gf "Lohit-Tamil.ttf.temp.GOADB" are not required but somehow automatically gets added by makeotf. * We should replace -ga with -nga for not using GlyphOrderAndAliasDB. GlyphOrderAndAliasDB file is provided for ease of writing feature file. * User can write feature file with user friendly names and use GlyphOrderAndAliasDB for adding name required as per standard. * If one not using GlyphOrderAndAliasDB, he should remove "-ga -gf "Lohit-Tamil.ttf.temp.GOADB" and put -nga instead. 5. run makeotfexe removing problem cuasing arguments. And here get you Lohit.ttf build by adding .fea file with AFDKO. Hope so it will help to some others as well. I specifically found this very useful for finding issues in Lohit-Devanagari.fea files. DIT is working on this project with CDAC and other stakeholder almost from 2+ years. I am one of the committee member of this working group and making sure it will actually benefit target audience. We have invested earlier time on what should be the structure of this document and what things must be included in this documents. Also we had excellent debate with language scholars on what is valid combination in Hindi language and what is not. How particular combination should get displayed. We made one significant decision saying we will not say anything is invalid, since there is possibility of inclusion of words from other language to Hindi and end use must be able to type it. Number of things happened over the time from 1.3.1 version to latest 1.4.4 and finally we are very closer to have final release of this document. 1. Target audience is ICT stakeholders. 2. Platform owner interested in supporting particular language in his product will get complete information from locale, sorting, backspace, delete, rendering etc from single document. One can also say this document is simply including standards around Hindi language at one place. Those are Unicode, CLDR and language related standards. 3. 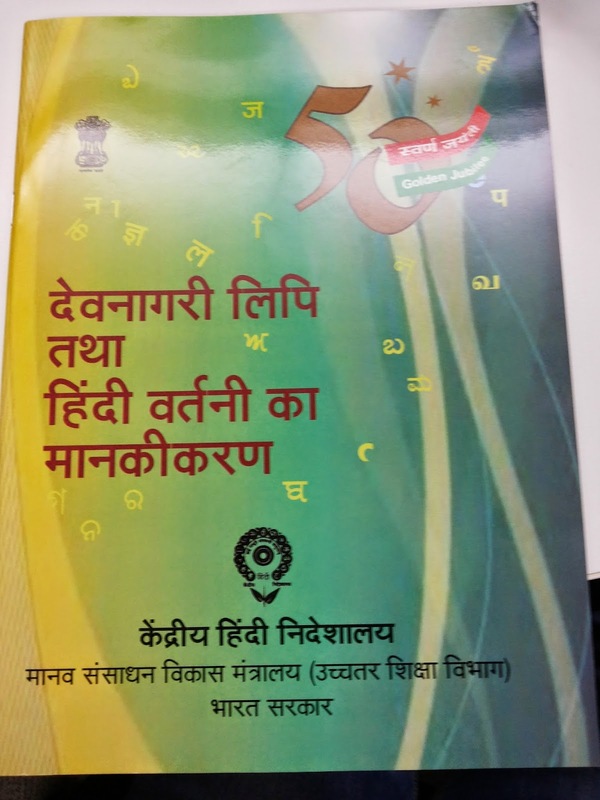 For Hindi draft reference is used from book "देवनागरी लिपि तथा हिंदी वर्तनी का मानकीकरण" Central Hindi Directorate"
Yesterday we quickly gone through draft to make sure conjuncts are represented properly in document. Hindi mostly uses half form of base characters unlike complete conjuncts get form in Marathi language. Draft is still open  for comments and feedback. Once Hindi will get finalized same process will be repeated for other language and all these Draft will get authenticated from BIS as a standards. For other languages DIT will first prepare draft and in later stage talk with state governments for Feedback. Next one will be Marathi since most of the things are already ready for Marathi languages. I hope this will help to community over the time. In last phase we did excellent improvements in Devanagari, Gujarati, Gurumukhi and Malayalam with Lohit2 projects. Bengali is already done i need to test it for completeness then i can do the release of same soon. Now remaining are Kannada, Oriya, Tamil and Telugu. We are moving ahead and started working on Tamil development now. Renaming glyphs as per AGL. Create testing file which covers most of the combinations. Testing with Harfbuzz and Uniscribe. Follow Tamil script standards. Unicode. I need help specifically for following items. Creating test file with adding important combinations. Identifying standards around Tamil script, i did not found other than Unicode yet. #flocktofedora 7th and 8th August AT Prague, Czech Republic and me !! First talk of the 7th morning for me was "From Schedule to (awesome)". The important thing we should note is EOL bug closing. Almost 4 to 5 thousands bugs get auto closed during EOL. Yes, Reporter'ss do get notifications regarding closing of bugs but i think developers should take active involvement and make sure any relevant bug should not get closed without fix. Next talk from "Tuan Anh Truong" on "Improving Ambassadors Mentor Program", he mentioned number of issues from Ambassadors program including he does not get replys from some of his ideas and again APAC budget was not used fully and this time it get reduced. He specifically said almost 30 Ambassadors from India but no one is active. I had discussion with him later on and promised that at least i will do some contribution. During break i had nice conversation with Mattias and Christian about improving language support in Fedora and happy with there positive response, if time permits will definitely start drafting plan for this. After that we had some offline meeting on planning for Fedora 22. 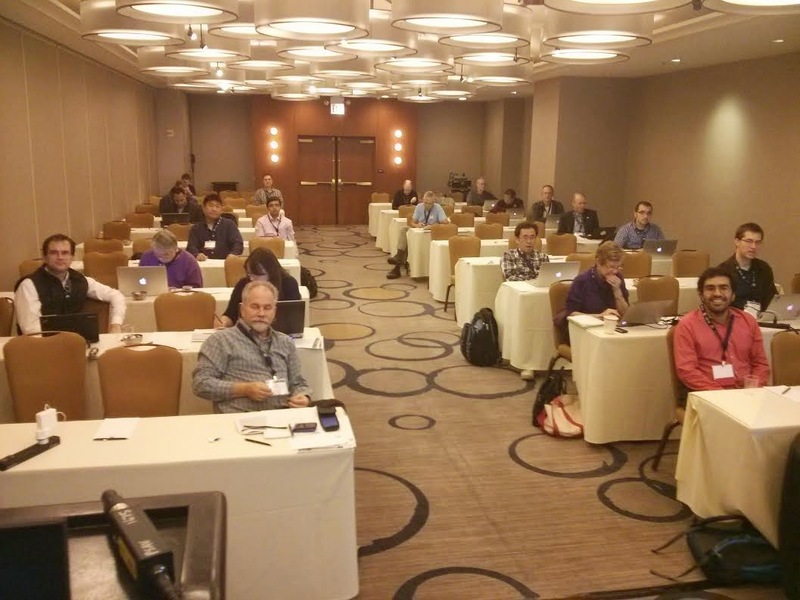 Attended last session of the day that is "Fedora.next.next: Planning for Fedora 22". This session where we had open house type discussion and taken mostly inputs from most of the attendees. We noted down positive, negative things in Fedora. what we can do for Fedora 22. It was long session but very fruitful session. After this session we had big discussion with Carlos of glibc. We specifically talked glibc Unicode support, Sorting issues and synchronising data with CLDR. We did some rough planning for future development. Most probably it will be proposed as a feature for next releases of glibc. Me, Mike, Anish and Jens were involved in this discussion. Lunch was very good on 3rd day, it was bit spicy. I liked it :) Not even used spices, i specifically brought from India. Fedmsg workshop was very informative for people interesting in building app on Fedora messaging stuff. Ralph Bead given nice tips for doing it. If you still not there join #fedora-fedmsg on Freenode and see how it tracks each change in Fedora. Last workshop i attended was from Parag and Haikel. The workshop is specifically memorable since 2 FPC, 9 package sponsors were present there. !! Third day we got some time in the evening and done some shopping. Its awesome to walk on Prague's road. Did not attended Dance party planned on 3rd day. As i written in earlier blog as well, so many things happen so do check #flocktofedora for more information. Arrived on 5th morning to Prague so it gave me good time to get rest and get ready for the first day of flock. After keynote immediately my presentation was scheduled , got a nice audience. Recording for my presentation is available at . Basically i talked on four things, why fons are important, not much happening in Fedora for fonts. I proposed one fonts portal named open source fonts world for gathering all opensource fonts available in different distros. Presenting fonts in better way, more categorized way and prepare some analysis of what is present and what is not. I have done some work earlier and alpha is available at . Feel free to ping me if you are interested in contributing to it. Or if any more ideas.. I must say there are lots of interesting talk in flock and some are happening parallel, so missed some good talks. Lunch was nice, though place is 5min walk from conference venue but that is good, Prague is best city for walking. !! Lunch time was bit more than what i expected that is 2 hrs but i think it is good from contributors networking consideration. Workstation talk recorded available at , must watch !! for 4pm to 4.45pm session i took break since i was very tired and had some offline conversations with attendees. I attended "Fedora Ambassadors: State of the Union"  session from Jiří Eischmann. Understood two topic regarding number of Ambassadors are inactive from long time. APAC did not able to use there whole budget so budget got less in current FY. I do not remember any Fedora 20 release party in India this time. So yeah, people interested in Fedora and want to celebrate Fedora success, want to spread word do come up, we need you. I will definitely do some contribution to Ambassador program this year. We have only one mentor from India that is Kushal. I really like Fedora student University representative program idea, hoping that plan will get into production soon. So had nice and fruitful first day @ flock 2014. I am sure there are many more things happened than my blog, so do go through other blogs and tweets tagged with #flocktofedora for getting glimpse of it. All is set for attending Flock 2014 conference !! Almost 2 months, when i started planning to attend flock-2014  conference. Had number of hurdle including talk selection, sponsorship for Travel, then VISA issues. Now just 3 days to go for flock and happy that everything is perfectly set for attending conference. I will start my journey tomorrow from India. Thanks to Fedora for providing sponsorship for Travel and Accommodation. Specially thanks to Ruth for helping in booking flight tickets. I am going to talk on "Better presentation of Fonts in Fedora". Excited to talk on this interesting topic and have get together with numerous Fedora contributors. Schedule of Flock is excellent with added some Fun items. I am sure after reading this post all font developers of well know Devanagari script fonts will start looking at there fonts again and start thinking there font is for which language? Either they have developed font for Devanagari script or is it font for some specific language or it is simply a mess ? As most of you know Devanagari script is widely used for number of languages. Major languages in this list are Hindi, Marathi, Nepali, Konkani, Sanskrit, Maithili, Kashmiri and Sindhi and some more languages. Each language has some specific requirements from Devanagari script as follows. Kashmiri, Marathi, Sindhi and Sanskrit has specific characters defined in Unicode Devanagari code page. This is bit easy to identify, since Unicode has mentioned it clearly for codepoints. This one is bit tricky and one must go through each language standard documents from Governments or standardization organizations. I would like to mention some important differences here. 2. Different behaviour of conjuncts across language. This one is really painful, since there are not 3-4 but lots of conjuncts characters are different in widely used languages like Hindi and Marathi. Hindi language mostly prefers horizontal ligature (i.e. simply half form of characters) while language like Marathi, Sanskrit requires ligature form of conjunct which is used to be stacked. when you see, download or use any Devanagari font, you will definitely start thinking this font is for which language exactly? Font for Hindi language with horizontal ligatures? Font for Marathi language with Stacked ligature? Pan Devanagari fonts supporting all language? Even though its pan devanagari fonts, what it renders in en_US/en_IN locale? Lohit2 is one of the best example of how to handle this effectively. Still it needs some fixes for default behaviour of Lohit Devanagari font. Since Devanagari is widely used for Hindi language, i am in fever of making default behaviour of Lohit Devanagari to match with Hindi language and for other languages one should either download Lohit fonts for specific language (lohit-marathi, lohit-nepali) or select appropriate locale while using Lohit Devanagari. Still question arises if default behaviour matches Hindi then, why it is called Devanagari, but i think answer is since it supporting other languages as well it is called Lohit Devanagari. In last six month we have completed Devanagari (Marathi and Nepali), Gujarati, Gurmukhi and Malayalam under lohit2 project . We have done significant improvement in these fonts not only from technical perspective but also from standards perspective. I am confident enough to say Lohit follows all standards around fonts and Indian languages and scripts guidelines. This is time to do improvements in Lohit Assamese and Bengali. Followings are improvements we are looking for..
Rewriting efficient open type tables. Support to the "beng" and "bng2" open type script tags. Testing on Harfbuzz NG, Uniscribe(W8). One of the important task prior to development is to identify guidelines, specifications for Assamese and Bengali script. We do have TDIL documents available and will see if there is any other. With these improvements i am sure Lohit Assamese and Bengali can become standard reference font for upcoming Bengali fonts project. Need help from Assamese and Bengali language expert. I know few already and will ping them for more input during the developments. Development activity is going to happen in lohit2  git. I just did a quick review of fonts released by Karnataka Government [a]. This is not from rendering perspective but from technical aspects of the fonts. 1. Font is specified as a Serif in PFM family. Fonts is sans-serif still style is incorrectly given in true type fonts. 2. Version should not contain wording like "Initial Beta release". Presently given versions are like:- "1.000 2013 initial Beta release"
Please refer [b] for version guidelines. 3. Font Embedding Permissions should be more relax. Presently it is only Editable embedding. It should Installable fonts so even receiver of document can use it. Font has some glyph names starts with "_". "If multiple glyphs in a font represent the same character in the Unicode standard, such as "A" and "A.swash," they can be differentiated by using the same base name with different suffixes. The suffix (the part of glyph name that follows the first period) does not participate in the computation of a character sequence. It can be used by font designers to indicate special characteristics of the glyph. The suffix may contain periods or any other permitted characters. For example, small cap "A" could thus be named "uni0041.sc" or "A.sc."" 6. 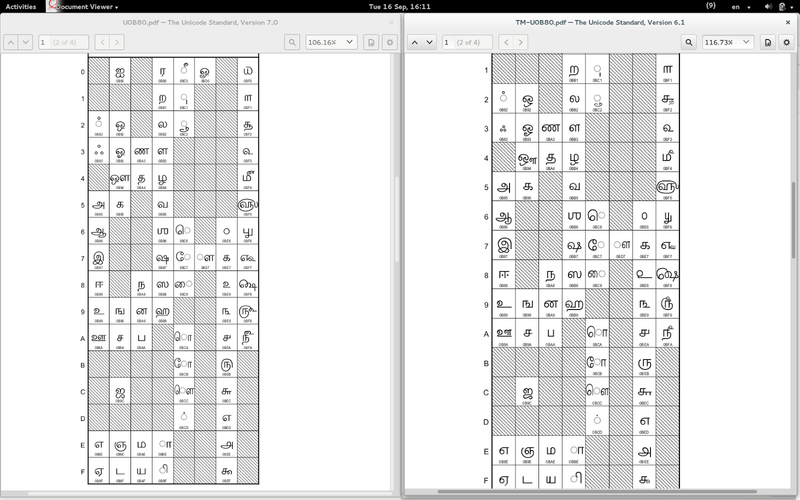 This is not a bug but font contains 1478 glyphs. I am sure one can make same quality font with less number of glyphs by using Open type GSUB and GPOS tables. 7. Normal and Bold version of font should have same family name. Above mentioned bugs should be fix before the purchase and release of the fonts from Government. One should test rendering of these fonts with latest stable version of Harfbuzz-NG included in most of the key projects including Libreoffice, Gnome, Android and so on. These rendering issues must be fixed before the release of the fonts.